A careful and honest audit of how your business performed in 2018 is a healthy practice. Anything that can be measured can be improved. A business audit can provide valuable information with which you can make adjustments, create plans, and set goals for the coming year. No successful business owner is satisfied just to maintain the status quo; that is a sure recipe for disaster and bankruptcy. Owning and running your own business is similar to climbing up a steep muddy slope. If you are not making a concerted effort to move upward, you are sliding backward. You cannot sit in place. It is recommended that you contract with a professional auditor from outside your organization to perform this task. They will know how to examine each area of your business, ask hard questions, demand to see pertinent data, not get tired of the process and cut corners, and present you with honest answers. Such transparency is vital in order to make the necessary changes for improvement. However, in many small businesses, especially solopreneur or sole-proprietor businesses, this audit is performed by the owner. If you are the kind of person who can step away and look at your business dispassionately, then you can probably produce an effective and useful audit. You can save money doing it yourself, but only if you can be painfully honest and detailed in your examination. What’s my direction? Examine where you are now, where you want to go over the next year, and even the next three to five years, and how you intend to get there. What are my current and future target markets? Which markets should I compete in, how will they change, and what does the business need in order to connect with these markets? How do I gain market advantage? How can my business perform better than the competition in my chosen markets? What resources do I require to succeed? What skills, assets, finance, relationships, technical competence, and facilities do I need to compete? Have these changed since I started? Your answers to these questions will lay the foundation for how you examine each area of your business. Below are the basic areas to audit and some things in each area upon which you should focus your attention. This is where you evaluate the products you make or services you provide. What makes them successful and how they could be improved? Could you (and should you) launch new or complementary products or services? How effectively are you matching your products and/or services to your customers’ needs? If you’re not quite sure what those needs are, you should perform a new market or customer analysis. Which of your products and/or services are succeeding? Which aren’t performing as planned? Decide which products and/or services offer both a high percentage of sales and high profit margins. What’s really behind the problems of a product and/or service? Look for “quick wins,” easy fixes that make fundamental improvements. Are you reviewing costs frequently? How efficiently to you conduct your business? Are you mainly reactionary in nature, or do you maintain a set strategy and stick to it? Even a set strategy can benefit from some flexibility, but how you make decisions in your business should be based on a plan, not whims. Do you make best use of technology such as wireless networking and mobile phones to allow for more flexible working? Do you suffer from high staff turnover? Are staff motivated and satisfied? Can you contract outside workers? Do you have the skills available that you need in areas such as human resources, sales, and IT? Can some of your staffing be handled through outside contractors? Your business finances should be under constant scrutiny, but an overall yearly evaluation is healthy. Financial management and planning should always be included in any audit. Your income, costs, and needs can always change due to market shifts and trends. Working capital – have your requirements changed? If so, explain the reasons for any movement. Cost base – keep your costs under constant review. Make sure that your costs are covered in your sale price. Growth – do you have plans in place to adapt your cash flow and financing to accommodate changing needs and growth? Who are your biggest competitors? How are they doing compared to your success? You will probably find it useful to do a SWOT analysis (strengths, weaknesses, opportunities, threats). This will show you how you are doing in relation to the market in general and specifically against your closest competitors. How do they price their products and/or services? What are the profiles and numbers of their customers compared to yours? What are their competitive advantages and disadvantages compared to yours? These primary areas and beginning questions will undoubtedly lead to even more questions about your business. That’s a good thing. The more questions you ask and answer honestly, a clearer picture of your business is revealed. Only through honest evaluation can you discover what your business does well so you can capitalize on it. And, you’ll discover what you don’t do so well, and take steps to fix it. What did your business audit reveal? 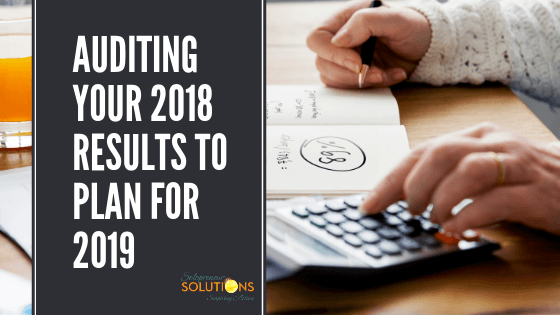 What are 5 things you will be doing differently in 2019 as a result of your 2018 business audit?